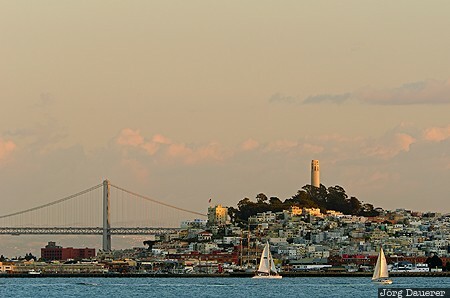 San Francisco with the Coit Tower and the western side of the Bay Bridge in the background and two sailing boats in the foreground illuminated by warm evening light seen from Fort Baker below the Golden Gare Bridge. San Francisco is in California in the west of the United States. This photo was taken in the afternoon of a sunny day in November of 2012. This photo was taken with a digital camera.